After a 40 year hunt, scientists have tracked down the genes responsible for fluorescent proteins in Obelia medusa - a type of jellyfish. Knowledge of these genes could lead to new fluorescent protein tags for use in cell biology. The discovery of the gene encoding green fluorescent protein (GFP) in the jellyfish Aequorea victoria paved the way for GFP to be introduced as a fluorescent tag in cell biology. It is used to track the positions and interactions of proteins in cells, and led to the Nobel prize in chemistry in 2008. Fluorescent proteins similar to GFP were discovered in Obelia medusa during biochemical studies in the 1970s; however, despite repeated attempts, nobody was able to clone the gene responsible for making these proteins. Now, Mikhail Matz and his team at the University of Texas at Austin, US, have solved the problem by taking a different approach. 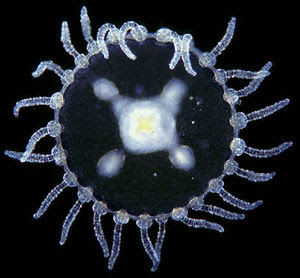 Obelia has two main stages of life, a polyp attached to a surface and a free swimming jellyfish. Previous attempts to identify the genes responsible for the fluorescent proteins focused on the polyp. 'The trick this time was to use the jellyfish as the starting point,' explains Matz. To their surprise, the team discovered not one, but three different fluorescent protein colours: green, cyan and yellow. This is the first time that three different colours of fluorescent protein have been found in an organism outside of the Anthozoa (a class of organisms that includes sea anemones and corals). Knowledge of the gene encoding GFP allowed it to be introduced as a fluorescent reporter in a wide variety of cell biology experiments. Now that the equivalent genes have been discovered in Obelia, scientists will be able to discover whether these GFP homologs could make similarly useful tools.